Remember those generic breakfast cereals that came in the black and white boxes? One of the biggest reasons why any of us wanted to go grocery shopping with our parents was because we had to make sure our dear, sweet, dumb parents didn’t try to totally cop out on the breakfast cereal selection by reaching down to the bottom shelf and selecting the generic version of our favorite fruity, chocolate-y, or marshmallow-ridden cereal. Sure, we could understand how they might think it was a better choice - it was cheaper, it looked like the same thing, but we knew it wasn’t. Call it a sixth sense, call it expert taste buds…but something about it was just different. The fact that it was so subtle made it even worse…something was trying to trick us, and we weren’t having any of it. 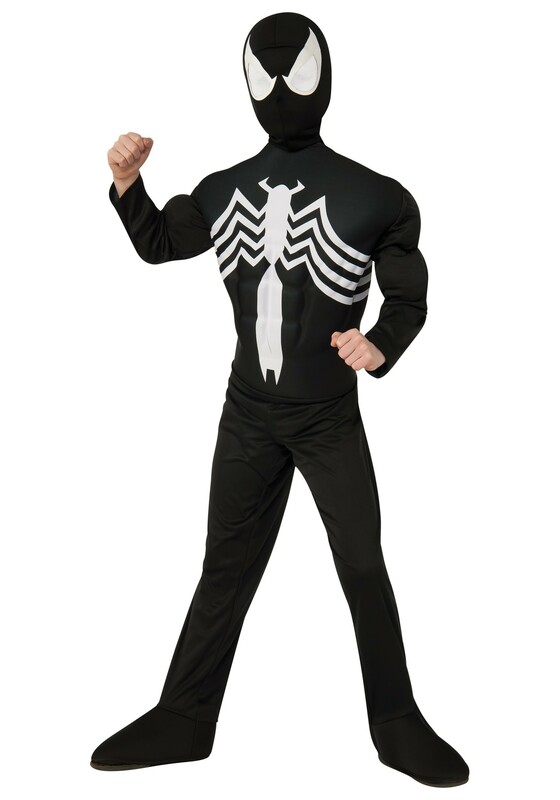 We’re reminded of that when it comes to this Child Ultimate Black Spider-Man Muscle Chest Costume. It looks like Spiderman, only in black and white packaging…so sure, any geek off the street could tell you that it’s basically the same superhero. But we know better! We know that it’s really Venom, a Symbiote - which is a sentient alien for those who are uninitiated into the world of Marvel alien lifeforms - who requires a host, usually human, to bond with for its survival. And who did it choose for that first lil’ human home? You guessed it - Spiderman, until he got wise and realized what was up and separated himself from it. Then the Symbiote went on to merge with other hosts, most notably Eddie Brock, its second and most infamous host, with whom it first became Venom and one of Spider-Man's archenemies. So now it’s basically nothing but Spiderman in a black and white generic cereal box, which is horrifying! At least it is for us…for Venom, he’s now one of the greatest threats to humanity. Which is cool for him, we guess. Those black and white packages, man...they're basically deception dressed up in a (super cool looking) costume!